December 26, 2009 -- World-renowned political organiser and one of Africa’s most celebrated poets, Dennis Vincent Brutus, died early on December 26, 2009, in Cape Town, in his sleep, aged 85. Protest in iRhini against attacks on Kennedy Road shack dwellers. October 8, 2009 -- Pambazuka News -- You don’t need presidential palaces, or generals riding in tanks, or even the CIA to make a coup happen. Democracy can be overthrown with far less pomp, fewer props and smaller bursts of state violence. But these quieter coups are no less deadly for democracy. At the end of September 2009, just such a coup took place in South Africa. It wasn’t the kind involving parliament or the inept and corrupt head of the African National Congress (ANC) Jacob Zuma. Quite the opposite. It involved a genuinely democratic and respected social movement, the freely elected governing committee of the shack settlement at Kennedy Road in Durban. And this peaceful democracy was overthrown by the South African government. On September 2 and 3, 2009, the Constitutional Court of South Africa will hear the final appeal in a case brought by five Soweto residents challenging Johannesburg's discriminatory prepaid water meter system. Their six-year legal battle would reaffirm the constitutional right to water for all South Africans. Low-income communities in Johannesburg's townships do not have sufficient water resources and do not receive the same water services as residents in wealthier, often white, suburbs. Yet, the Bill of Rights of South Africa guarantees everyone's right to have access to sufficient water. 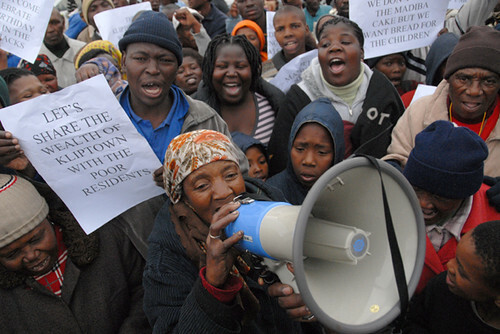 Shack dwellers protest in Durban. July 5, 2009 -- It wasn't always this way for Sebokeng, one of the older urban ``townships'' in South Africa, a place synonymous with the early settlement and subsequent massive growth of the black industrial working class. 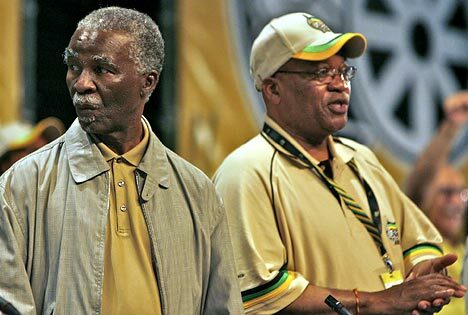 Jacob Zuma (right) will maintain Thabo Mbeki's course. April 16, 2009 -- We are now in a world radically different from what it was a mere four months ago. The world economy is collapsing, torn apart by an economic recession. Thousands of workers are being thrown out of work; millions find themselves hungry in the midst of plenty of food; millions are homeless in the midst of houses being repossessed and standing empty. Factories that once produced bricks and cement are standing idle when millions require shelter. Neoliberal capitalism has over the past 30 years inflicted untold misery onto the world's poor whilst simultaneously making a very small minority filthy rich. Neither the ANC or COPE offer answers for South Africa's poor. 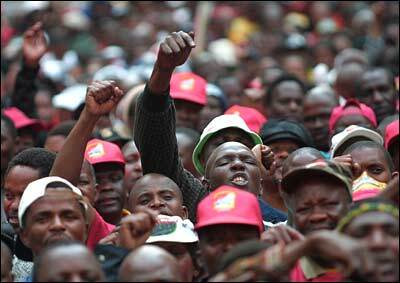 On April 22, 2009, South African voters go to the polls to elect a new national government. The ruling African National Congress (ANC) government will be opposed by a new split-away group, the Congress of the People (COPE), led by former ANC leaders opposed to the current ANC leader Jacob Zuma. Below, the Anti-Privatisation Forum's Dale McKinley assesses their policies.